I've let many winters and pomegranate seasons go by without writing about آش انار ash-e anar. 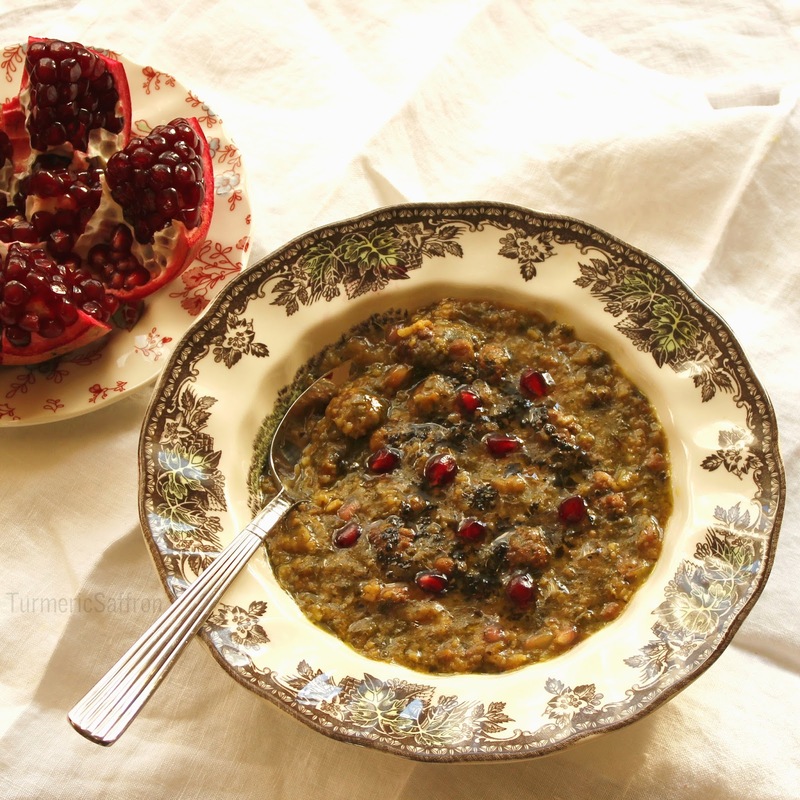 However, this time as I watch the icy snow flakes rapidly hit the windows and pile up all around the house I'm thinking it's time to post a recipe for this hearty and tasty ash-e anar. The idea of making a warm ash on a cold day or when you feel a little under the weather and need a pick-me-up was passed down to me by my mother. I make ash reshteh all the time and chances are if you open my refrigerator you'll find a bowl tucked in somewhere. Not to mention, after all these years living in America, it's only recently that I've been finding large, ruby-red, juicy pomegranates in the market by where I live. 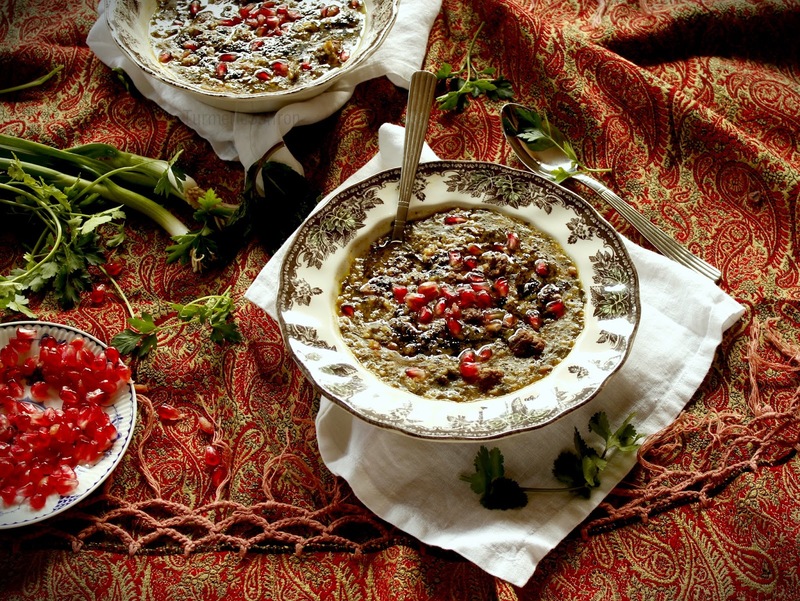 You can make this soup with brown or green lentils if you are not a fan of yellow split peas. If you choose to use لپه lapeh (yellow split peas) I would suggest boiling them for 7-10 minutes on medium heat, remove any of the foam that comes to the surface, drain and then add to the stew. When making the کوفته قلقلی koofteh ghelgheli -mini meatballs try to make them as tiny as possible. They should be easily scooped up by a tablespoon. If you find the recipe a little sour you can add a little sugar to the stew. This recipe serves 6-8 people but if you want to make less you can easily cut the amount of ingredients in half. And I think you should definitely serve this ash with نعنا داغ nana dagh - fried dried mint and oil mixture. Combine the yellow split peas and 2 cups of water in a medium saucepan, bring to a boil over medium-high heat, skimming the foam from the surface, lower the heat and cook for about 10 minutes. Drain and set aside. Heat 3 tablespoons of oil in a large pot over medium heat, add the onion and cook until until golden brown, add the minced garlic, saute for 2-3 minutes, stirring frequently. Add 1/4 teaspoon turmeric powder, stir well. Add the rice, split peas, and 8 cups of water to the pot. Bring to a gentle boil over medium-high heat. Reduce the heat and cook over medium-low heat for 30 minutes with the lid slightly ajar, stirring occasionally. In the meantime, combine the meat with 2-3 tablespoons of the chopped vegetables, 1/4 teaspoon turmeric, salt and pepper. Mix thoroughly. Take small piece of meat mixture and form into meatballs. Continue shaping until all the meat is used. Heat 2 tablespoons of oil in a skillet over medium heat and fry the meatballs until brown on all sides. Add the meatballs, pomegranate molasses, chopped vegetables, salt and pepper to the pot. cover and simmer on low heat for another 30-40 minutes. In a small pot, heat 2-3 tablespoons of oil over medium heat, add a pinch of turmeric and 2 tablespoons of dried mint, stir and remove from stove. Pour the ash into a large serving bowl, drizzle with nana dagh and garnish with pomegranate seeds, if desired. Serve with warm bread. Wow. Looks amazing. I'll make it this week! Azita joon, this is one of my absolute favorites. My grandmother used to make it for me. 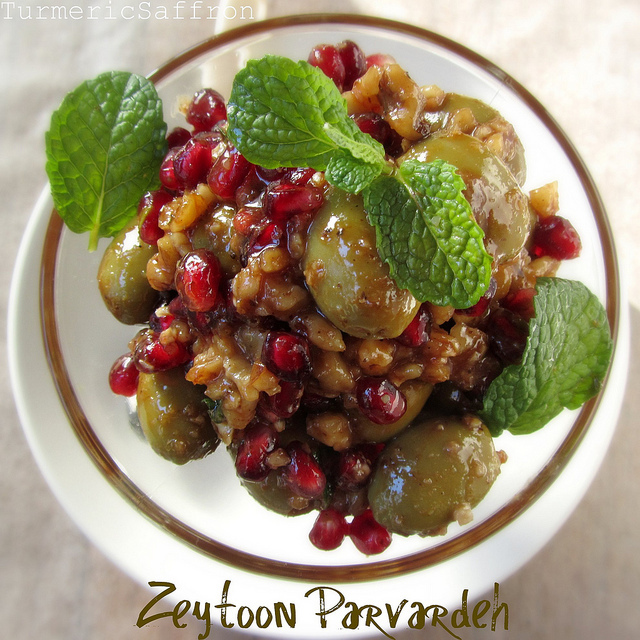 I just recently discovered the magnificent persian cuisine and your blog is a great inspiration! Looking forward to trying this recipe! This is my favorite Ash. Your version looks amazing. 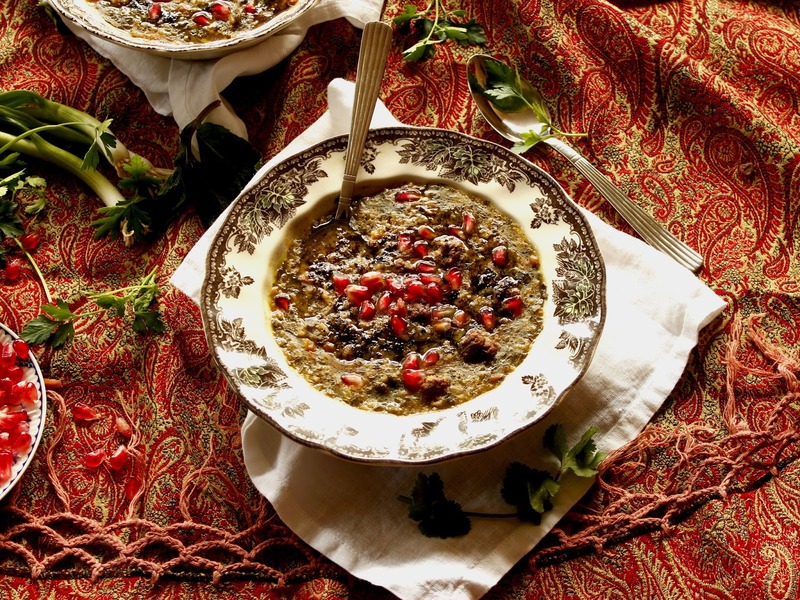 Never heard of or even imagined pomegranate in soup, but I'm so glad I discovered it here! Thank you so much for the recipe. I made it for shabeh yalda and it was a hit!